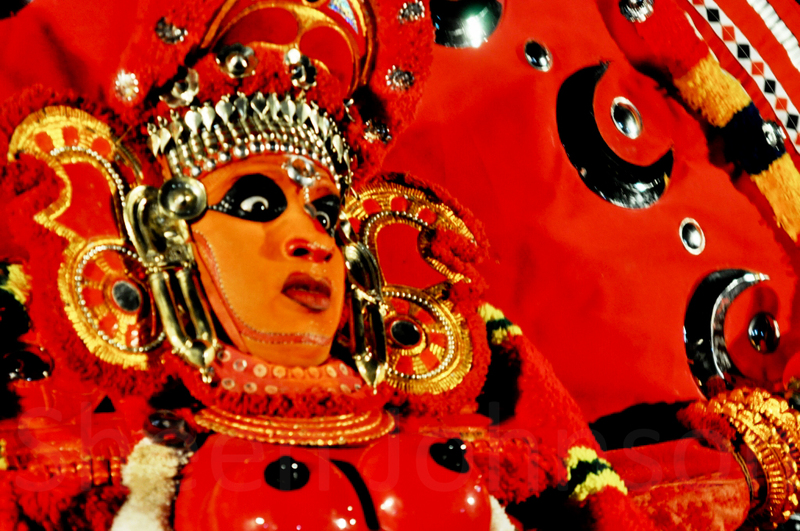 One of the salient features of Theyyaattam is its colourful costume. 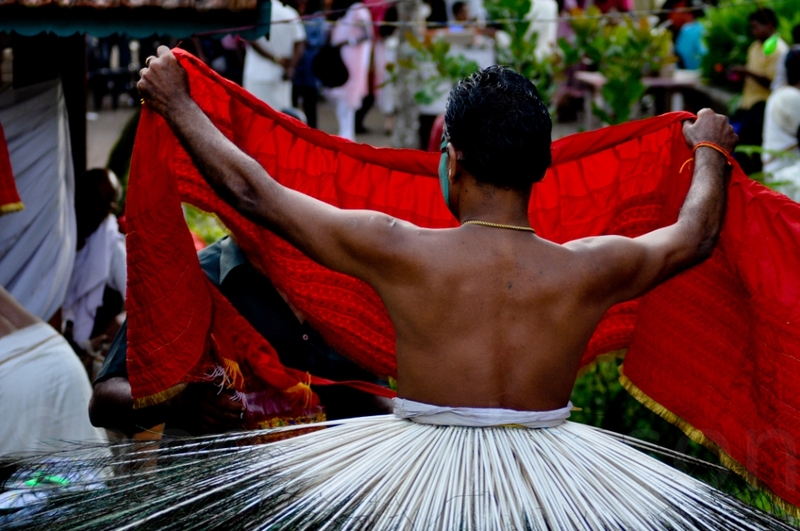 The typical waist dress of heroes is found in Kativanoor veeran. This is called Arayota or Vattoda or Atukkum Chiraku and made out of splices of bamboos and covered by red cloth. For a few Theyyams, this waist dress is woven out of young, coconut leaves. 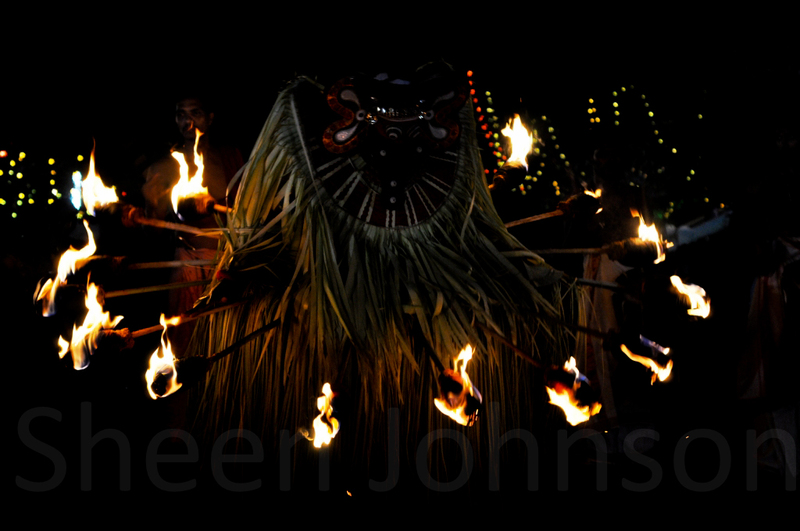 The Theyyams like Vishnumoorthi and Pottan require this dress especially as they leap into the fire. Above the waist dress the naked body is painted with different native colours. 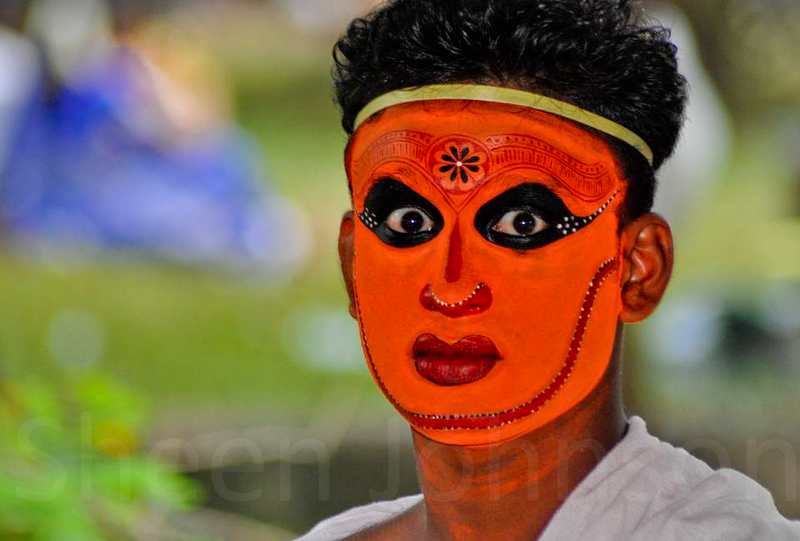 The particular system of painting the body of a Theyyam differs from that of other Theyyams. Parunthuvaal Ezhuthu (eagle’s tail) and Anchupulli Ezhuthu (five dots) are some technical terms for body painting. 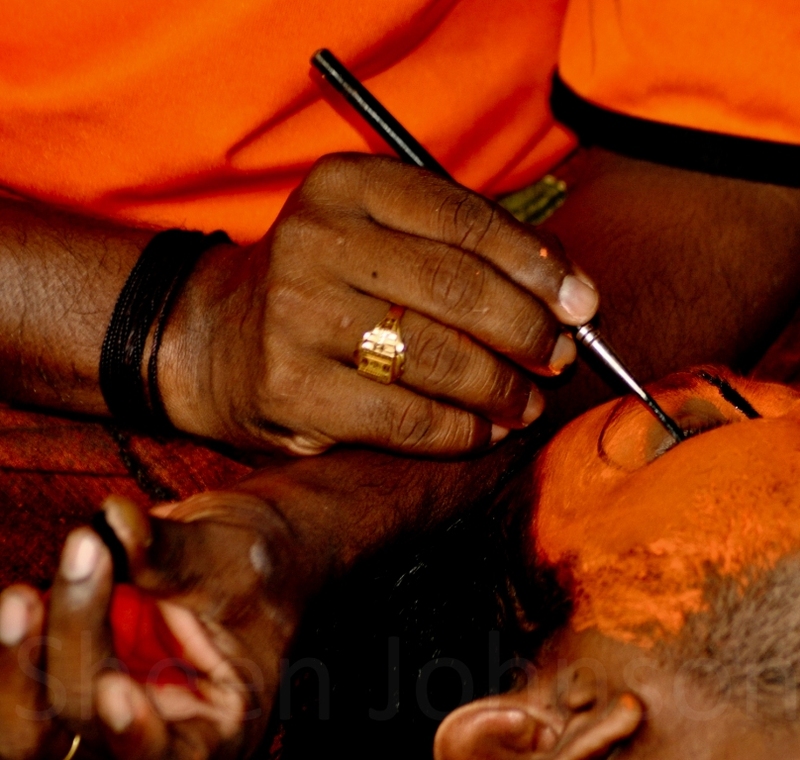 For painting the faces of the players Praakkezhuthu, Sankezhuthu, Naagam Thathal Ezhuthu, Varezhuthu, Narikurichezhuthu and Kattaramezhuthu are a few well known systems widely adopted. 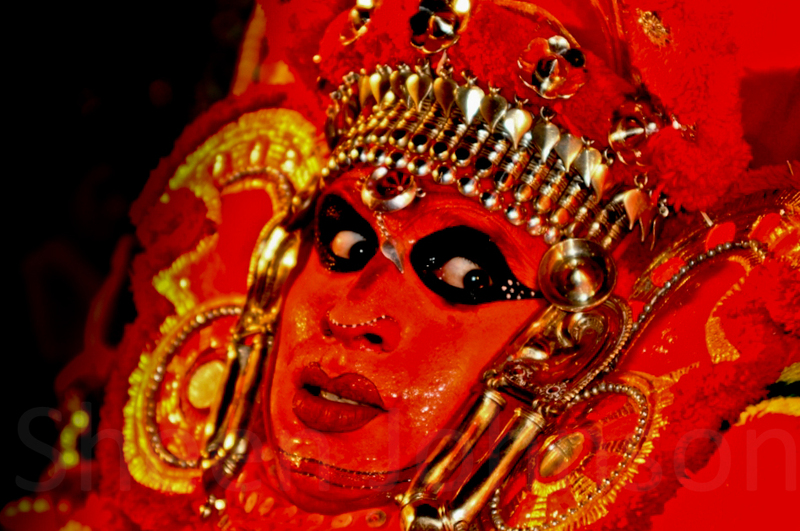 The head-dress or Muti also differs from Theyyam to Theyyam. Some well known Mutis used for Theyyaattams are Pookkatti, Ponmuti, Vattamuti, Chattamuti, Valiyamuti, Kondalmuti, Puthachamuti, Onkaramuti and Peelimuti. These Mutis are made out of bamboo splices and wooden planks which are covered with coloured cloth, flowers and coconut leaves. In new Mutis, peacock feathers are also used. The Theyyams of Kshetrapaalan and a few Bhagavathis use nearly 50 or 60 feet high long crowns or Mutis made out of arecanut tree and bamboo splices. These crowns are supported by long bamboos which are held by several helpers to keep the balance when placed upon the head of the player. According to the local customs, these long crowns are either covered with coloured cloth or thatched with coconut leaves. Some Theyyams of Bhagavathis wear a silver diadem of small serpents heads crowned with red flowers. A huge golden collar elaborately carved of wood and set with fancy jewels is worn in some items. The female deities wear ornaments and a wooden breast called mularu. 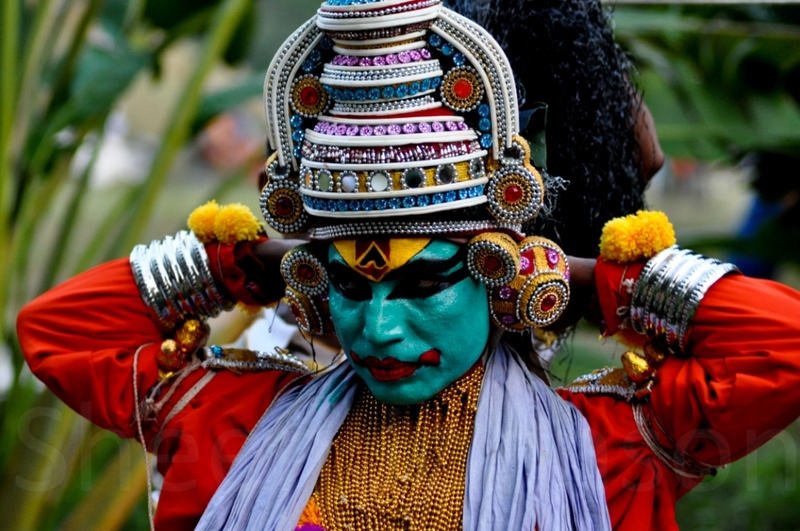 The Theyyams of Othenan and Baali wear round crowns called kireetam. 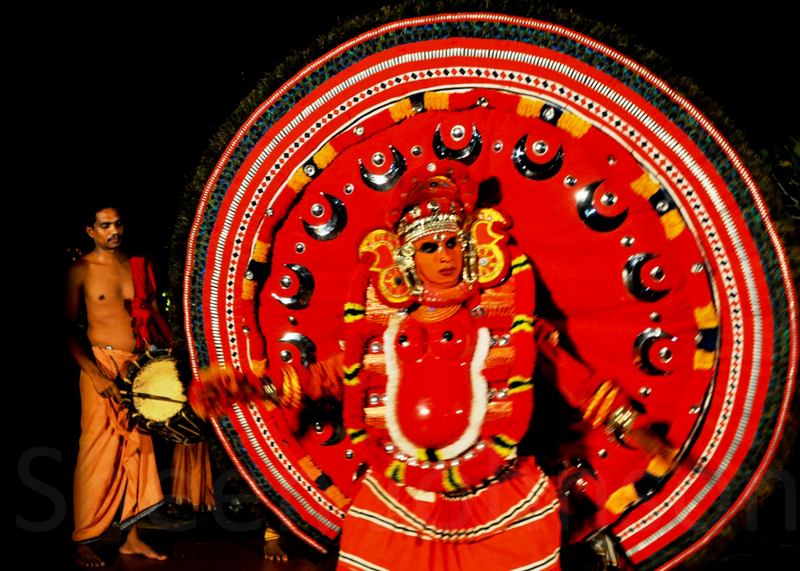 The same kireetam is used in Kathakali performance. 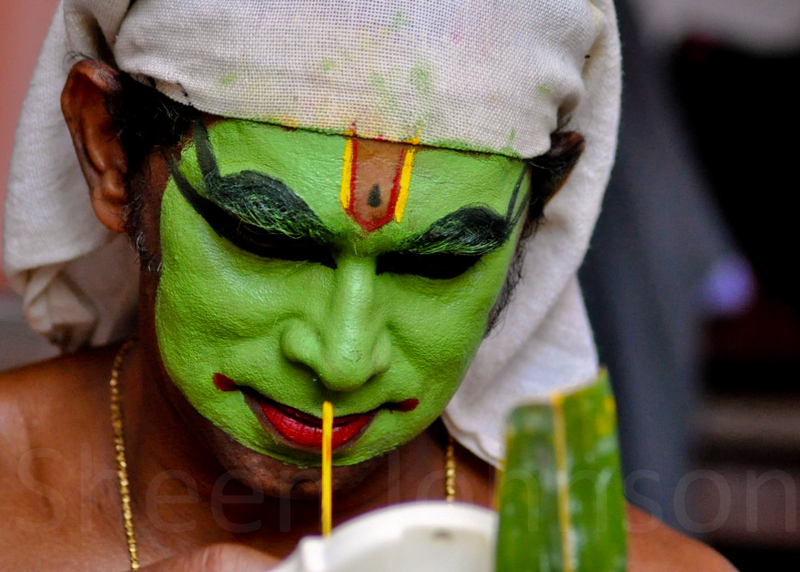 In a few Theyyams like Pottan, masks made out of the leaf sheaths of arecanut and wooden planks are used. The breasts of goddesses are generally covered with glittering ornaments and make-up known as Ezhutharam (Seven models). All male and female Theyyams wear bangles called Katakam and Chutakam and small anklets on the feet. In the case of Bhagavathis in Roudra mood, (fearful appearance) torches are appended to the waist and the crown produces a terrible appearance.